Take a dive into this specialist skill and learn fundamental cymbal patterns, drills and tricks to improve your speed and dexterity and dance and musical combinations to challenge all levels. Finger cymbal playing is traditionally associated with many styles of belly dance. Whilst it is essential for ATS® and other Tribal Improvised styles, it can also add an exciting and dynamic layer to your Fusion presentation. The first workshop will demystify the art of playing an instrument whilst dancing! 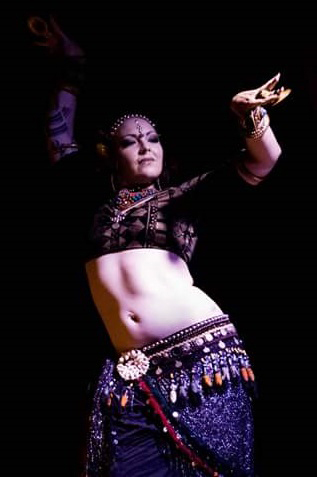 We will cover some basic techniques for playing zills along with a variety of patterns, then layering these over belly dance steps and Tribal Fusion combinations to create a short combination. Dancers should have some basic belly dance experience but no previous experience of finger cymbal playing is necessary. Focussing on some more complex patterns, rhythms and methods of playing the zills, this workshop is perfect for dancers who have some experience with finger cymbals or for those who have attended the Cymbology Beginnings workshop. We will consider musicality; how finger cymbals can be used as an instrument to complement the music, when to play alongside the musicians, when to play a different rhythm and when to use the zills to compliment the movements in the body. Please bring finger cymbals if you have them though there will be some available to borrow. PayPal prices include fees, please contact to pay by bank transfer.